We’re excited to announce the release of RStudio Connect: version 1.4.4.1. 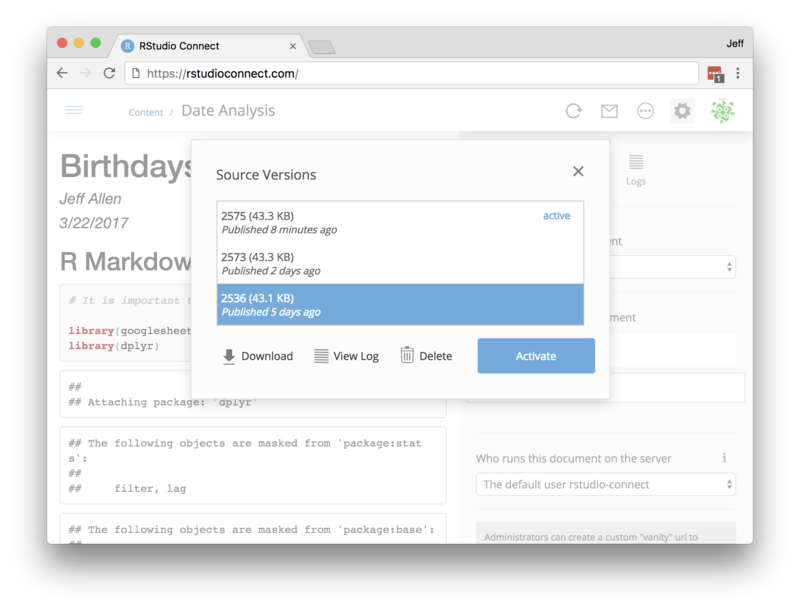 This release includes the ability to manage different versions of your work on RStudio Connect. The most notable feature of this release is the ability to “rollback” to a previously deployed version of your work or “roll forward” to a more recent version of your work. You can also download a particular version, perhaps as a starting place for a new report or application, and delete old versions that you want to remove from the server. Specify the number of versions to retain. You can alter the setting Applications.BundleRetentionLimit to specify how many versions of your applications you want to keep on disk. By default, we retain all bundles eternally. Limit the number of scheduled reports that will be run concurrently using the Applications.ScheduleConcurrency setting. This setting will help ensure that your server isn’t overwhelmed by too many reports all scheduled to run at the same time of day. The default is set to 2. Create a printable view of your content with a new “Print” menu option. Notify users of unsaved changes before they take an action in parameterized reports. The release also includes numerous security and stability improvements. If you haven’t yet had a chance to download and try RStudio Connect we encourage you to do so. RStudio Connect is the best way to share all the work that you do in R (Shiny apps, R Markdown documents, plots, dashboards, etc.) with collaborators, colleagues, or customers. You can find more details or download a 45 day evaluation of the product at https://www.rstudio.com/products/connect/. Additional resources can be found below.